I haven’t made a layer cake in absolute ages. And I do so love layer cake. They’re always gorgeous to look at. And Food52 sent round this email with all these pictures and I got to thinking about layer cakes again. Also how much I want a life that will include moments with tables like the one with all those cakes. So yesterday I did a scout online and found this recipe. Okay, in truth I made the Princess chose what to make in the end because I couldn’t. I realised about halfway through that I actually should have made half the amount of cake and ganache as this makes a lot of cake so I’ve experimented by freezing half the uncooked batter and the excess ganache that was left over after I’d iced the cake. At some point in the future I am going to unfreeze the batter and see if I can get cake again. So, as I said, I used milk and dark chocolate in the ganache. I also used half double/half single cream so that it didn’t become too rich and split. I used spelt flour in the cake and half the dark brown sugar it called for, adding the rest in light brown sugar. I wanted to make the cake without wheat flour and I find white spelt flour works well on a 1-1 substitute. 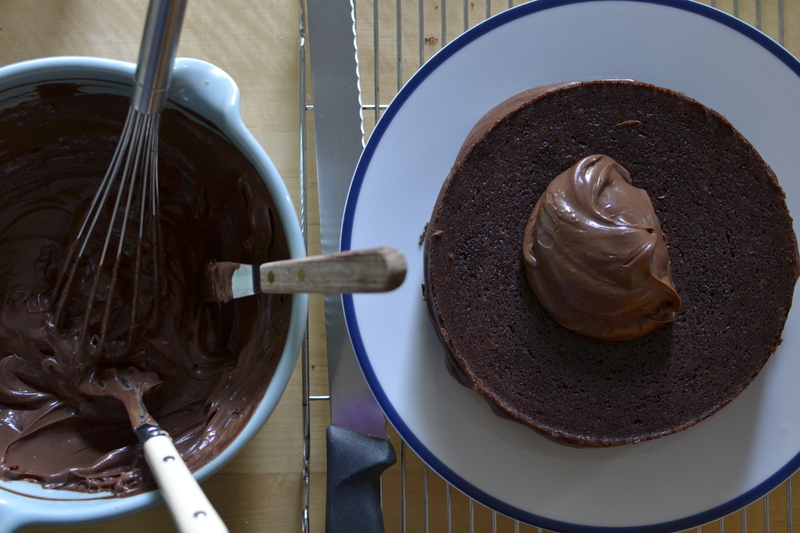 Make the ganache first as it needs to cool at room temperature for about 6 hours before you can use it. Heat the two creams in a saucepan. Break all the chocolate into a heatproof bowl. When the cream is at scalding point (it’s about to boil), pour it over the chocolate mixture. Let everything stand for five minutes before stirring it smooth. Add in the butter last. Leave to cool. Preheat the oven to 175C and line two 20cm baking tins with butter. Cream together the butter, sugars and vanilla until fluffy and thick. Sift the flour, cocoa powder and baking soda. Then add in the salt. Fold in the flour, alternating with the buttermilk. I usually do three flour additions and two buttermilk ones. Lastly fold in the mayonnaise. Divide the mixture between the two tins, smoothing them on top. Bake for about 40 minutes, until the cakes spring back and a skewer inserted comes out clean. Cool for 10 minutes in the tins before turning out and cooling completely on a rack. To assemble, make sure the cakes are cooled completely. Cut the cakes in half. Spread with ganache and then sandwich together. If you’ve made the full mixture this will make 4 layers. I only made half so mine was a two layer cake. 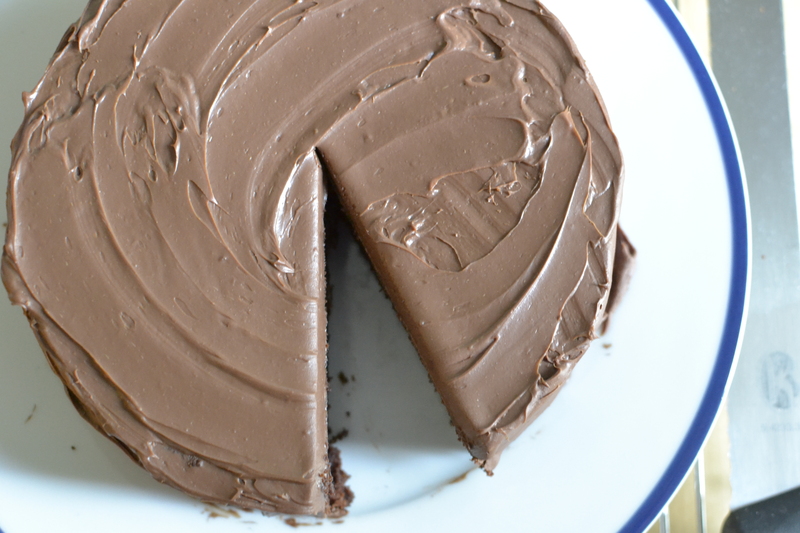 Use the ganache to do the top and sides of the cake.